Not to be confused with Buchanan, Virginia. Buchanan County is a United States county in far western Virginia, the only Virginia county to border both West Virginia and Kentucky. The county is part of the Southwest Virginia region and lies in the rugged Appalachian Plateau portion of the Appalachian Mountains. Its county seat is Grundy. Buchanan County was established in 1858 from parts of Russell and Tazewell counties, and it was named in honor of then-President James Buchanan. In 1880, part of Buchanan County was taken to form Dickenson County. As of the 2010 census, the county population was 24,098, and had a double-digit percentage population decrease over the last three censuses. In addition, as of 2012, Buchanan was the fifth-poorest county in Virginia, when ranked by median household income and has been consistently in bottom 5 % percent over the past decade. The county was formed in 1858 from parts of Russell County and Tazewell County. 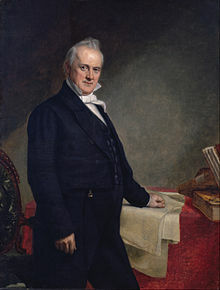 It was named for James Buchanan, the 15th President of the United States. In 1880 the southwestern part of Buchanan County was combined with parts of Russell County and Wise County to become Dickenson County. Helen Timmons Henderson (1877–1925) helped participate in the work of the Buchanan Mission School at Council, Va. She and Sarah Lee Fain (1888–1962) of Norfolk became the first two women to be elected into the Virginia General Assembly. They were both Democrats in the House of Delegates. When Helen was in office, the delegates agreed to let 6.2 miles (10.0 km) of improved road to be placed from Russell County, across Big "A" Mountain, to Council. Route 80 is also known as "Helen Henderson Highway." In 1876, Grundy was chosen and became the county seat of Buchanan County, it was named in honor of Felix Grundy, a Senator from Tennessee. According to the U.S. Census Bureau, the county has a total area of 503.8 square miles (1,304.8 km2), of which 502.7 square miles (1,302.0 km2) is land and 1.1 square miles (2.8 km2) (0.2%) is water. It is home to Poplar Gap Park. The county is divided into seven supervisor districts: Garden, Hurricane, Knox, North Grundy, Prater, Rock Lick, and South Grundy. As of the census of 2000, there were 26,978 people, 10,464 households, and 7,900 families residing in the county. The population density was 54 people per square mile (21/km²). There were 11,887 housing units at an average density of 24 per square mile (9/km²). The racial makeup of the county was 96.75% White, 2.62% Black or African American, 0.06% Native American, 0.14% Asian, 0.10% from other races, 0.33% from two or more races, and 0.47% of the population were Hispanic or Latino of any race. There were 10,464 households out of which 30.60% had children under the age of 18 living with them, 60.90% were married couples living together, 10.60% had a female householder with no husband present, and 24.50% were non-families. Of all households, 22.50% were made up of individuals and 9.40% had someone living alone who was 65 years of age or older. The average household size was 2.46 and the average family size was 2.87. In the county, the population was spread out with 21.40% under the age of 18, 8.50% from 18 to 24, 31.20% from 25 to 44, 27.50% from 45 to 64, and 11.50% who were 65 years of age or older. The median age was 39 years. For every 100 females there were 102.90 males. For every 100 females age 18 and over, there were 102.30 males. Buchanan County is represented by Republican A. Benton Chafin in the Virginia Senate, Republican James W. "Will" Morefield in the Virginia House of Delegates, and Republican H. Morgan Griffith in the U.S. House of Representatives. Buchanan county is a Republican Stronghold. They vote for Republicans by astounding margins. However, they used to be very friendly to Democrats, but have seem a major shift towards Republicans. All public schools in Buchanan County are operated by Buchanan County Public Schools system. ^ State and County Estimates through 2012. Small Area Income & Poverty Estimates. U.S. Census Bureau. Retrieved on 2011-07-06.